Lissa Bryan: The #ShieldGeeks Review #VIKINGS "A Simple Story"
The #ShieldGeeks Review #VIKINGS "A Simple Story"
Heillir! The Shieldmaidens of History (Protecting the Innocent from Anachronisms) welcome you back to our series on the History Channel show Vikings. We—Lissa Bryan and Sandi Layne—are two historical fiction authors with a serious thing for Vikings. And for VIKINGS, the amazing series that is going to begin its fifth season on HISTORY CHANNEL. Follow us on twitter, #ShieldGeeks where and Sandi and I will be live-tweeting during each episode, as has been our custom since Season One. We follow up with a more detailed discussion on our websites the following day. Lissa: The episode opened with the aftermath of the battle. There are still bodies scattered on the field. 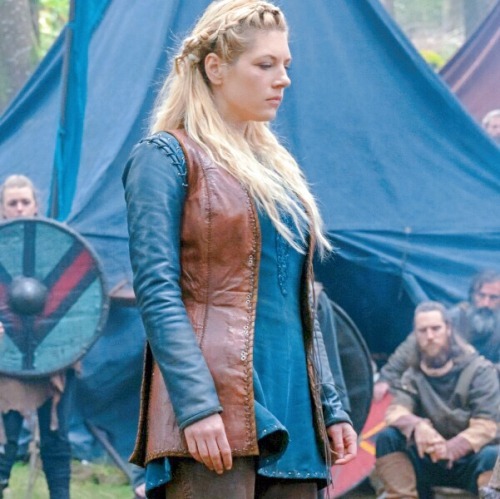 Lagertha walks through her camp and we see that she’s wearing a tunic and vest over a pair of pants. In silhouette, it looks like something a modern college girl would wear in the fall. When the camera zoomed in on her, we all stared at the blue … pleather… sleeves she was wearing. It was obviously meant to resemble leather, but leather that thin and shiny and bright blue wasn’t really a thing in the Viking era. Sandi: The post-battle scene was particularly effective, in my opinion, by the wonderful job History Channel did in portraying the battle itself in the prior episode. And due to our recent dissatisfaction with some of the costuming and cosmetic issues in the show, I really appreciated seeing the authenticity in the "average Viking ensemble" presented here. The rough weaves, the uneven edges, the layers of woven wool. Colorful, yes, but that wasn't so hard with textiles. Lissa: Sandi, you researched leather dying for this episode. What did you come up with? We talked briefly about how it was difficult to achieve vibrant colors in textiles, let alone leather, because dyes were plant-based. Sandi: Coloring textiles was largely a matter of repetition, once a suitable color had been achieved. Different plants—and parts of the same plant, too!—could be boiled down, salts or other additions included—and the spun yarns of wool or flax (linen) would be saturated with the color. Dry, soak, repeat. Leather, though, is a very different thing. Leather would have to be worked and tanned to the desired suppleness. A lighter leather would require some form of bleaching, which often involved ammonium (derived from stale urine in most cases). Then the leather would be rinsed and wrung to remove excess water before dying. THEN was the tricky part. Especially with blue! Medieval records indicate that the leather was "passed through" water that had alum dissolved in it. 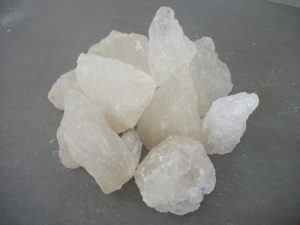 Alum—what we now believe to be aluminum sulphate —was the most common mordant used when a dye required it. A mordant is a chemical fixative used to help bind the dye to the material being colored. Alum, though the most common, was difficult to acquire. It had to be rendered by various means from other ores or minerals, combined with the dye, and then boiled into it to make it one before the leather would have been passed through the treated water. At this time of history, the chemical was most commonly brought to Europe through North Africa or Asia, along the silk routes. This made it costly, so it wasn't often used. And though the Vikings did indeed have blue clothes, the blue would have been mostly common among the textiles, where it would have faded, certainly, but not as readily as it would with leather. All of which is to say, Lagertha's blue leather? Probably not a thing in 9th Century Nordweg. Even black leather required a lot of work if it needed to be dyed to achieve that color. All leather dying required a lot of work and chemical fixatives. And even then, if the leather were improperly tanned, the dying wouldn't hold. 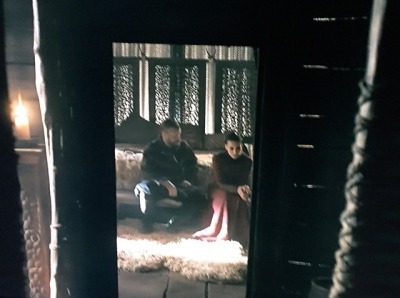 Lissa: Anyway, Boot Sole File Sleeves aside, Lagertha is talking to Torvi, who is caring for Heahmund. She tells her that Heahmund will survive his wound. Heahmund is awake, and he looks pretty good for a guy somewhat-mortally wounded just a day or so previously. He and Lags chat about the gods, life and death, and then there’s an odd segue into sexuality as Heahmund tries to explain agape love to her, but makes it sound like bisexuality. Whether intentionally or not, it’s hard to say. I guess without the word “Platonic” being in common parlance, it might be a little more difficult to explain the concept. Sandi: This was indeed an odd scene. I see both Lagertha and Heahmund trying for dominance of one sort or another, here, while also endeavoring to be civil, show—ahem—interest, and leave a door open for further discussions. Heahmund wants to be on the good side of the Chick in Charge, clearly, for more than one reason. Some of his reasons are undoubtedly more earthy than others, but one cannot discount his spiritual foundations here, even so. Lagertha is intrigued—she carries fond memories of another priest, I imagine—and her curiosity is piqued. Besides she can afford to be generous. Maybe getting to know this priest will give her insight to her enemy, Ivar. Lissa: Harald is upset about losing the battle. Ivar lays on a bench in his hall as Harald tells him that he will never be fooled again by tales of Ivar’s brilliance at strategy. Sandi: Harald is a lot more polite than he might have been, here, but then he is a man in his own hall, and that lends weight to his words. Or it should. With Ivar, it is hard to tell, at this point. Lissa: Ivar says Harald approved the plan. 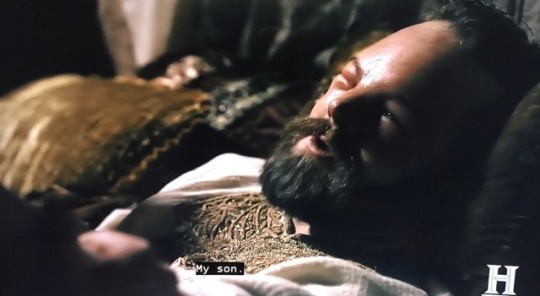 Hvitserk suggests they contact Uncle Rollo and ask for assistance because Rollo said to him before he departed that if they ever needed assistance, all they had to do was ask. Ivar says Hvitserk should leave in the morning. Sandi: We remarked during the episode that Hvitserk couldn't have been all that old when last he saw Uncle Rollo. Hvitserk is about twenty-one at this point in the story, and he probably saw his father's brother a decade ago. Did the lad truly remember his uncle's words or was he scavenging his memory for the sole purpose of having a place, here?I don't know, but his eagerness to go indicates he was very keen on carving a Hvitserk-niche for himself, however temporary. Lissa: Joan Jett is in her bedroom when Harald comes in. She looks introspective. Sandi: I imagine, if she is learning wisdom at all during her sojourn as queen, that she has to be exhausted by putting on a face that is not suited to her. No wonder she appears introspective. Lissa: He asks her what she’s thinking about… their child? She says she’s always thinking of her child. She requests that if they’re ever at war again, he not restrain her from going in to fight. She says she wants her unborn babe to hear the cries of battle. Sandi: Still chuckling about your tweet, Lissa! Lissa: We mentioned again last night that despite the way their relationship began, Harald has treated Joan Jett with great respect and consideration. He’s done everything he could to make her feel like a fully engaged partner in ruling their kingdom. No one could fault his post-marriage behavior, by the standards of the day. Hey, even by modern standards, he’s being a pretty good husband! Harald planning retirement. "And after your inevitable death in childbirth -"
Sandi: He's really a good husband. Seeing as how he does eventually become the first King of Norway in actual fact, it's nice to have something good here about him rather than our first rapine impressions. *sigh* Also, Harald is showing restraint. Kingship has, in one way or another, been long on his shoulders and he carries it easily at this juncture. Lissa: Ubbe, in his own bedroom, is talking to Torvi. He says he regrets marrying Margrethe. She is much more ambitious than he thought. Torvi is concerned and says she left her children in Margrethe’s care. Ubbe tells her he’s confident Margethe won’t harm them. But he wishes that Torvi was the one carrying his child. Sandi: I do feel for Ubbe. I do. He married Margrethe because it was a symbol of "I got her and all of you wanted her!" Not uncommon, that feeling, perhaps, but his reasons for matrimony were hardly high. And marrying a former was beneath his stature as a prince, as well, which seems to be a theme in this series among the Ragnarssons. At least sometimes. That he is disappointed and complaining to another woman—one who is probably a bit older, has proven herself to be stable and mature and fertile and willing—is unsurprising. They'd do well together . . . if they're allowed to, that it. Which I tend to doubt. Lissa: Lagertha is told that a huge number of ships have arrived to assist Harald carrying more warriors than can be counted. The scene is interspersed with them arriving in Harald’s home city. Frankish troops march down the street as Ivar smiles in satisfaction. 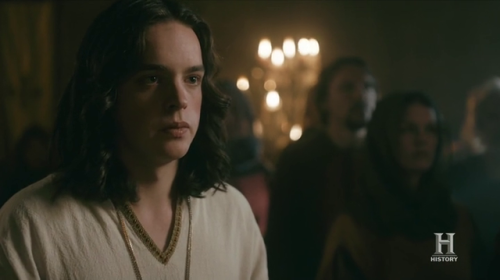 Sandi: Hvitserk looks so smug, here, and I was reminded of boys watching soldiers at a parade when I saw him and Ivar smiling at the Frankish troops. Lissa: Rollo has been contacted by Hvitserk and sent soldiers to assist in Ivar’s fight against Lagertha. Rollo himself has not come – too many responsibilities. But he sent his support. Hvitserk, who was the one who went on the mission to contact Rollo, tells Ivar that Rollo had one condition – that Ivar spare Björn’s life. Ivar smiles and says he’ll consider it. Sandi: Rollo was certainly very busy . . . BUT. If he had more fully supported Hvitserk and/or Ivar, he could have made time to accompany his forces, if not fight with them. Rollo, at this juncture, is likely in his late 50's/early 60's, and would have been beyond his fighting years, but his presence would have lent consequence to his sending of the troops. And there were many ships, yes, but not as many as there might have been. A politic move for the Duke of Normandy at this juncture, to be sure. Yes, he helped, but no, he didn't lend total support by his presence. He can then claim to be "for" all of his nephews, as he asked for the life of Björn to be spared. Lissa: Björn says to his mother that he has to go and try to talk to his brothers, and so we see him travel to speak with Ivar, seated at a long table while Ivar lounges on the floor. Lissa: Björn says for the sake of his father’s legacy, they shouldn’t waste their people’s lives. Ivar says – quite correctly, to be honest – that Björn is only there because of the size of the force that’s gathering against him. He asks if Björn is frightened. Björn says he’s not and at a signal, Ivar has men rush forward to assassinate him. Harald jumps to his feet and shouts for them to stop. “This is not how we handle this!” he yells. Tell that Jarl Ingstad and the cat-killing Kalf, dawg. But Ivar calls them off. Sandi: Consider that it likely took three to five days for a ship to sail one way to Normandy to begin with, another day or three for the "Hi, Uncle, how's it going?" conversations to happen, with perhaps an introduction or two along the way. Then another few days to get back with the troops. Anywhere from nine days to perhaps a fortnight has passed since Ivar sent his brother on his errand. I mention this because so many things are happening that some sort of window is helpful. Harald seems genuinely unhappy with Ivar at this point, too. His dissatisfaction with Mister Tactician has had a chance to fester in the intervening weeks, I imagine. Lissa: Floki’s True Believers are working on a temple to Thor, but Eyvind’s family is still causing trouble. He believes Floki has begun this settlement to make himself into a king. 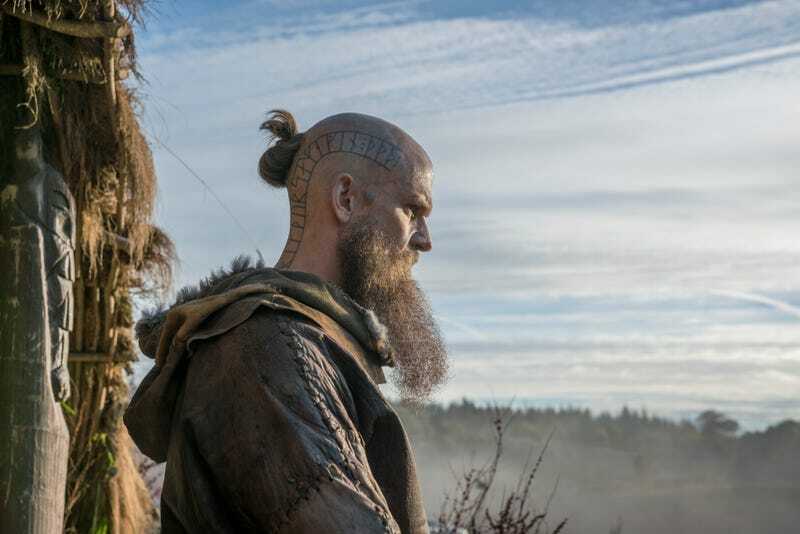 Floki, for his part, tells Ketjil that Eyvind’s plan is to stir up trouble and make himself the leader from the chaos. Sandi: First thing that struck me, here, was how much wood was being used. And did you see the carving of Thor? From my admittedly hasty research, the forests of Iceland were largely birch. A good tree, certainly, for building and fires and survival, but it doesn't lend itself to the large-scale statue-carving that was shown here. There is evidence for prehistoric pine in Iceland, but that's . . . well, a long time ago. The True Believers (some, anyway) argued that building a temple before homes was not a wise move and I am inclined to agree with them. On a side note, there is now a temple to Thor in Iceland, 1000 years after the nation identified itself as Christian. See this article at History.com. Lissa: Eyvind’s son, Bul, gets in a verbal spat with another settler who mocks him and calls him “Bul the Dog.” It turns into a fight. Sandi: First thing I thought when I heard that was "he's a bulldog!" Which, honestly, kinda worked for me, you know? So, as was discussed by Ketjil and Floki earlier, this was an attempt to start trouble and, here, trouble was largely averted. For a while. Then the temple is completed and things change. Lissa: Her face painted a pasty white and her head bedecked with a crown of sticks, Aud begins the ceremony to dedicate the temple. Sandi: The color on Aud's face could have been many things. White clay, ash from fires, almost anything could have been used. The coloring helped to make her anonymous, in a way. Her own features disguised so she could function as a priestess and represent the people, not just herself. Lissa: Goats are sacrificed and their blood runs down into a cup. The Believers pass the cup around, each taking a sip, until Bul strides up and grabs it. He flicks some blood in his friend’s face. The others chide him for blaspheming the temple and demand he return the cup. The man he fought with steps up and demands the cup and Bul flings it in his face. Floki is enraged by this blasphemy and draws his blade back to strike, but he stays his hand when Aud cries out, realizing the holy ground he stands upon. He drops the ax and runs away. Sandi: So, yeah. The communion service, here, is interrupted in a purposefully disrespectful manner. The target had to be Floki, at the heart, as he would not be able to stand for any disrespect to his gods. This turned out to be effective. And did you see Floki when the carved statue fell from its fiery height? Floki fell as well, to his knees. In fear of retribution or in sorrow at what had happened, I don't know. Lissa: Heahmund limps through Lagertha’s camp until he comes up to the woman herself. She asks him what he’s doing, and he says he wants to talk to her. About what, she asks, once she has him inside her tent. About everything, Heahmund says with enthusiasm. Life, death, the afterlife, fate, everything. He says he thinks she has some of the answers, and considering the circumstances, the timing is urgent. She asks him why that is and he says it’s because they’re going to fight again. That’s what she wants, isn’t it, for him to fight at her side? She asks him if that’s what he wants, and boy howdy, does he lay it on thick. He wants to fight for her, to die for her. Sandi: He really brings all the lines, as Dee Donuts says. This Heahmund is not necessarily acting as his historical self would have, but Michael Hirst is giving us a later-in-life-ish sexual interest between two charismatic characters, I think. (Thankfully, this is not a graphic display at present.) Personally, I adore wordplay and even if it does require boots to step around, it's amusing. Lissa: Lags says how can he know this after only having just met her, and Heahmund declares that he’s known her his entire life. Lagertha asks if he wants to sin a bit more and then blows out the candle. Sandi: Left me wondering if there was a deleted scene in here, somewhere. Lissa: I’m honestly not sure what Heahmund’s game is, here. I’ll buy that he’s attracted to her, because what man wouldn’t be, but I don’t think he’s being sincere about falling instantly and passionately in love with her, ready to sacrifice his life and honor, nor as receptive to her beliefs as he makes it appear. I suppose he’s of the opinion that a vow made to a heathen is worthless, but it would be nice to see some of his thought process here. And if he thinks Lagertha is a silly little woman who’s easily fooled by a man’s sweet words, he has another think coming! Sandi: I believe that Heahmund is using ALL his talents to get on her good side. He wants to stay alive, as he's said. He's definitely attracted to her and, as she's a beautiful pagan woman who feels no guilt over what she does (per their earlier odd conversation after the battle) he likely feels he can explore that a bit more. Ahem. Additionally, as a bishop, he has already shown his efforts to introduce the matters of his faith in amongst the heathen as he did with Ivar. I tend to think he's hoping for that as well, him being the conflicted fellow he is. 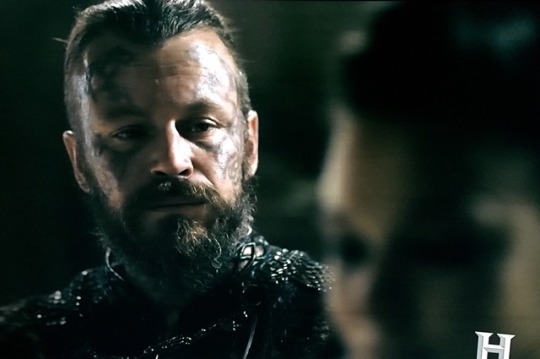 I don't think he finds Lagertha foolish; he's impressed by her. Might he have underestimated her? Oh, I'm sure he has on one level of another; she's a rather outstanding sort of woman. Lissa: Back home in Kattegat, Magrethe is walking with Torvi’s sons. She has a vision of Ubbe kissing Torvi, interrupted when one of the children mentions his mother. Margrethe asks him where he imagines his mother is now. The boy says she’s probably getting ready to fight and Margrethe tells him he’s stupid. Torvi has probably already been killed in battle and the boys should forget about her. The children stare at her, mouths agape, as she hisses that Torvi is dead, and she’s never coming back, except perhaps as a ghost. Day-um. I think we need to make a new category. "Margrethe's Bedtime Stories." Sandi: Really, really unhappy about this. I mean, it's not like we needed another reason to hate Margrethe and her psychological torture of small children isn't going to make us feel anything but more angry with her, yeah? She's petty and small-souled, I think, as well as foolish. But take a moment and look at the elder child she spoke to, in that scene. He reminded me of a young Björn as played by Nathan O'Toole in the first season. Just a bit. I hope Björn's sons fare better than the daughter he left behind! Lissa: In Wessex, Aethelwulf has called together all of the land’s nobles to discuss how they’ll meet the Viking threat. He compares the Vikings to stinging hornets, swarming in from all directions. Afterward, he retreats into his study to look at a book. When he’s turning a page, a bee swirls down and stings him on the back of the hand. Perhaps amused by the connection to what he’d just said, he gives a little huff, but then his breath starts coming short. Sandi: During his speech, he mentions "stinging" three times, I think. A hornet's sting, but still. I saw that this morning when I watched this episode again. (Thank you, Sling!) The foreshadowing is strong in this scene, yeah? Lissa: We next see him in his deathbed, swollen and agonized. As priests chant in the background, he speaks to Judith and his sons. He tells them they must love one another and do what is best for the kingdom. Then, delirious with pain, he speaks of the angels he sees surrounding him. Judith weeps as he passes. Sandi: The chamber he was in struck me as a bit anachronistic. More 12th or 13th Century Royal than 9th. The bedding of the era was less elaborate, relying more on furs and bolsters than the crafted pillows, even for a deathbed. Still the scene was rich in all that was Aethelwulf. He did his best, I really think so. And he died knowing he'd said all he'd needed to. 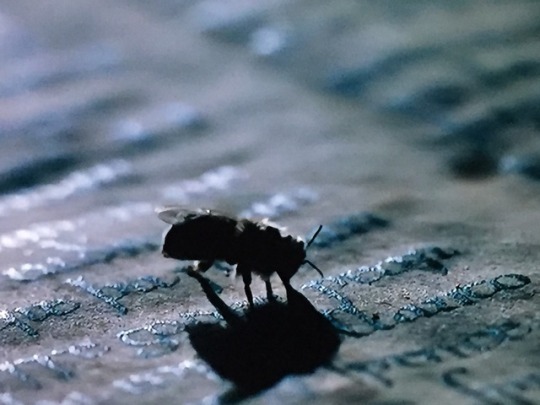 Lissa: Alas, poor Aethelwulf, felled by a bee! It certainly fit in with the theology of the era, that sudden death was all around them and could strike, inexplicably, at any time. Later, it’s mentioned that no one knows what killed him. There was no real forensic science in the era. They probably would have blamed poison, lacking a better explanation. Sandi: If they had blamed poison, you didn't catch a whiff of that in his death chamber. Sorrow, but no suspicion. Lissa: His character certainly grew a lot from the petulant, fanatical boy who married Judith. In the last season, you could see Ecbert’s influence very strongly. He focused on Aethelred, preparing him for the kingship, but he seemed to become a good king, a good father, and even a good husband to Judith. Sandi: He really did. We have in this episode the demonstration of good kingship in both Harald and Aethelwulf, though they'd fight in opposition. 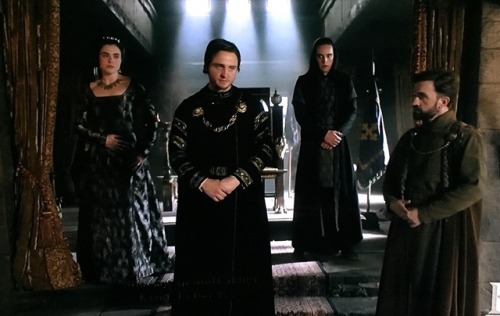 "And King Aethelwulf, having a lived a long life and fighting many foes, died peacefully on his bed..."
Lissa: Judith meets with Aethelred and Alfred afterward. She tells them the nobles will meet tomorrow to choose a new king and it will likely be Aethelred who is chosen. She tells him he must refuse the throne in favor of Alfred. Aethelred is not enthusiastic about the idea. His father had been training him for this. Judith tells him that these times call for a different kind of ruler; his grandfather knew that, knew that Alfred had skills and talents that Aethelred does not. What did Ecbert know of these times, Aethelred demands. Judith is only saying that because she was Ecbert’s mistress. But his attempts to shame Judith bounce right off. Sandi: The less said about Judith's determined manipulations the better—no, wait. All right. So, was she all about fulfilling Ecbert's dreams? Had she loved him to such an extent? Or was it all about getting Athelstan's son on the the throne? Or was it about thwarting her husband post mortem. Or could it have been about finally, finally exercising real power? None of that makes me happy, really. And her plotting and scheming irked. It was unfair to her sons, wrong of her as a queen, and showed her to be something of a grasping kingmaker. I wasn't thrilled. Lissa: She meets with a noble named Cuthred for dinner and tells him he must get the nobles to support Alfred. If he will, she’ll see to it that he gets a bishopric. Sandi: I get that she is trying to wield what she has, but it was vastly inappropriate of her. Unlike, say, Eleanor of Aquitaine, she didn't actually have territory or much experience in wielding authority. She just . . . wanted it. A lot. Lissa: The next day at the meeting, Cuthred calls for Aethelred to take the crown and all the nobles cheer enthusiastically. Judith grimaces for a moment, but then claps with the rest of them. But Aethelred says he cannot accept the crown, that they must choose someone else. Cuthred says if Aethelred won’t take it, then Aethelwulf’s second son, Alfred, should be offered the crown. Judith starts to clap, but there’s silence in the hall. Sandi: He was pouting; it's clear he was under some sort of dictate. What I wondered was WHY he obeyed his mother, here? He didn't really respect her, did he? And if he hadn't, if he'd just accepted the kingship, then no one could have gainsaid him. No one. And he could have packed Judith and even Alfred off to Kent or somesuch (where historically Aethelwulf had reigned not long before) and worn the crown himself. But, no . . .
Lissa: After a long, uncomfortable moment, someone calls out “…aye…” and a few other voices slowly, grudgingly, join in. Judith announces her “Aye!” as if anyone asked a woman’s opinion of the matter in the 9th century. Sandi: I know! It was really . . . weird. What was Hirst trying to do, here, other than make everyone look bad? Not that I have a problem with Alfred being a great king and all, and I know this is entertainment, not biography . . . but . . . yeah. Lissa: And so we see Alfred crowned, the scene entwined with one of Heahmund offering his sword to Lagertha, kissing the haft in pledge to her. Aethelred does not join in the cries of “Long live the king!” Instead, he glares angrily at Judith. Sandi: Can you blame him? Lissa: One thing you noticed during the ceremony was that Judith’s scarred ear was now on display. She’d always taken great pains to cover it, so it has to be significant. I wonder if, as when she let Aethelred’s words bounce off her, she’s saying she’s no longer going to be shamed by anything? Sandi: I see this, here, as a token of her refusing to live under a pall of shame. She doesn't have to protect her father-in-law/lover anymore. She doesn't have to protect her husband's reputation any longer. If anyone lives that remembers why she lost her ear, she will stare them down. That boy she suffered for . . . the one that caused her to be discovered as an adulteress . . . is king. And no one is going to make her feel ashamed of that. At least, that's my take on it. 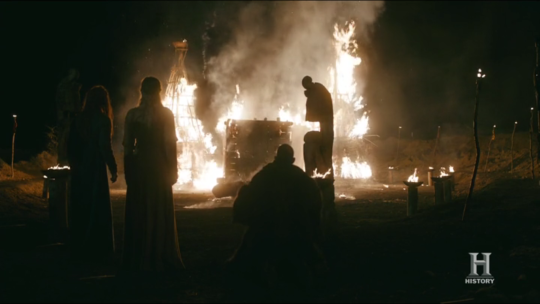 Lissa: Floki’s camp wakes to screams as Thor’s temple burns. 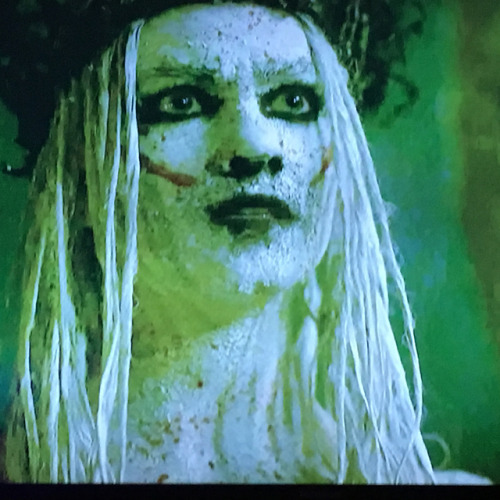 Sandi: Did you see Floki when the carved statue fell from its fiery height? Floki fell as well, to his knees. In fear of retribution or in sorrow at what had happened, I don't know. I didn't take Alfred's expression to be related, exactly, to what had gone on before, but I did like the montage overall. The taking of the scepter for Alfred and the sword for Heahmund contrasted with the devastation in Iceland. Alfred's turning as king contrasted with Floki's fall to his knees. Does this indicate the rise of Wessex and the Fall of Iceland? History tells us one tale; what will Hirst tell us? Thanks for joining us! Tune in next ODINSday for another episode! If you’re looking for incisive comments, please check out ProjectFandom. @DeeDonuts on twitter is the chick in charge, there, and she always has sharp things to say!